Home Uncategorized Cornerstone Rescues Cat. A VERY HUGE THANK YOU TO CORNERSTONE TREE SERVICE FOR COMING OUT IN THE SNOW AND COLD TO HELP RESCUE A CAT THAT WAS STUCK IN A TREE FOR 8 DAYS. 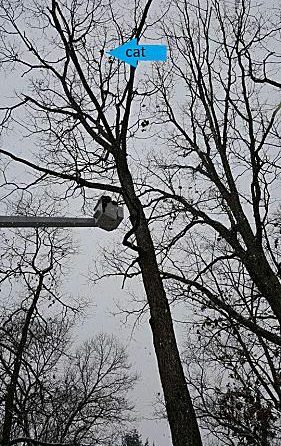 WITHOUT BRIAN CARNS WE WOULD NOT HAVE HAD A POSITIVE OUTCOME.THE CAT WAS 65 FT UP IN THE TREE. The plea for help was posted in Rancocas woods FB page by concerned neighbors. Daily attempts were made by the fire dept (and Thank you for all of your help) However, every time they would raise the ladder the cat would just climb higher and higher up the tree. To make it worse the tree was not easily accessible from the street, it was in a back yard quite a distance from the road.Which provided challenges for all that were involved. A message was put out to Cornerstone Tree Service since they have a bucket truck to see if they could help with the situation. Brian came out and took on the task of getting her down. As he went up in the bucket the cat started to move on the limb towards the thin ends of the branch. And She fell 65 feet.There were 7 of us on the ground with sheets ready to catch her. And we did successfully catch her in the sheet.